CarGurus has 2,138 nationwide 500X listings starting at $6,996. The 2017 500X might be Fiat’s most balanced vehicle. It takes the funky styling of the standard 500 subcompact, adds the interior space of the larger 500L, and blends them with a crossover’s taller ride height and optional all-wheel drive (AWD). Just one year after the 500X’s official introduction, Fiat is already making major changes. For 2017, Fiat has simplified the 500X’s lineup from five to three trims: the base Pop, the rugged Trekking, and the luxury-oriented Lounge. The 500X takes the exterior design of the 500, elongates it, and adds 2 additional doors. Many of the 500’s features are still present—the circular headlights, the Fiat emblem with chrome bars jutting out, and the square taillights. The 500X’s interior is less retro than the 500’s, but that isn’t a bad thing. The 500X is considered by many to have the most intuitive dash layout of all the Fiat models, partly due to its larger infotainment and climate controls. Rear-seat space is decent, with enough head and legroom for those under 6 feet tall. Cargo space, however, is where it falters—the trunk offers 12.2 cubic feet, which is small for its class, although folding the rear seats increases that to 32.1 cubic feet. The Pop trim level equips the 500X with 16-inch steel wheels with covers, power heated turn-signal-integrated mirrors, air conditioning, a fold-flat front-passenger seat, a 60/40 split-folding rear seat, and a 4-speaker audio system. The Trekking trim features unique front and rear fascias, 17-inch aluminum wheels, automatic headlights, a 3.5-inch color display in the instrument cluster, a 5.0-inch touchscreen with Uconnect, and a 6-speaker audio system. It also includes Fiat’s Dynamic Selector with 3 driving modes: Auto, Sport, and Traction+. The Lounge trim level adds 6-spoke 17-inch wheels, dual-zone automatic climate control, an 8-way power-adjustable driver’s seat, a 6.5-inch screen with navigation, and an 8-speaker audio system. 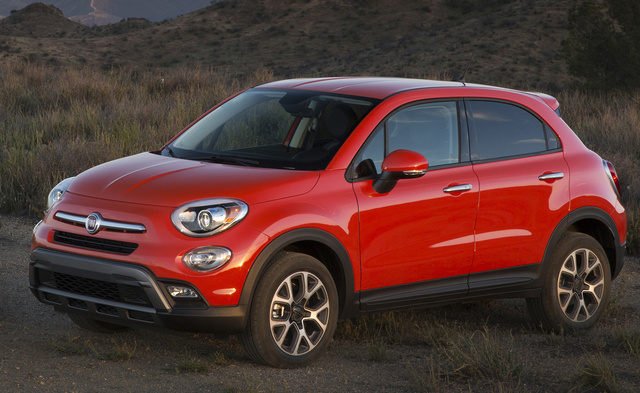 Fiat offers two engine choices for the 500X. The Pop trim is outfitted with a turbocharged 1.4-liter MultiAir 4-cylinder engine paired with a 6-speed manual transmission for an output of 160 hp and 184 lb-ft of torque. Previously, this engine configuration was offered only with front-wheel drive (FWD), but an AWD system is also available for 2017. The Trekking and Lounge trims feature a larger 2.4-liter Tigershark 4-cylinder engine with MultiAir2 that produces180 hp and 175 lb-ft. 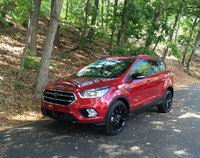 It comes paired with a 9-speed automatic transmission and a choice of FWD or AWD, and it’s also available as an upgrade for the Pop trim. The 500X’s AWD system is quite clever—it operates in FWD to save fuel, but it will automatically redistribute up to 50 percent of the power to the rear wheels if it detects slippage. Fuel-economy ratings for the 500X range from 21 mpg city, 29 highway, and 24 combined for the 2.4-liter engine with AWD to 25, 33, 28 for the turbo with FWD. All 500Xs come equipped with a full set of airbags, antilock brakes, stability and traction control, and hill-start assist. A reversing camera comes standard at the Lounge trim level and is available to the Pop and Trekking trims through an option package. An Advanced Safety package is offered for the Trekking and Lounge trims and includes blind-spot monitoring with rear cross-traffic alert, lane-departure warning with lane-keep assist, rear parking sensors, and forward-collision warning with automatic braking. The Insurance Institute for Highway Safety (IIHS) awarded the 2016 500X a Top Safety Pick+ rating. What's your take on the 2017 FIAT 500X? TheHorror How is the Fiat’s AWD system “clever”? That’s how nearly all such setups work now. Have you driven a 2017 FIAT 500X?